Andrew Crespo visits the RMHUC for a special faculty talk: "Investigation, Indictment, Impeachment? The Questions and Challenges Facing Special Counsel Robert Mueller" on Monday, November 20, 2017. 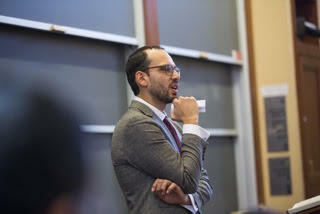 Harvard Law School Assistant Professor Andrew Crespo (AB '05, JD '08) is coming to Denver for a special lecture on issues surrounding the current work of Special Counsel Robert Mueller. Special Counsel Robert Mueller is investigating members of the Trump administration, the Trump family, and the Trump campaign for possible collaboration with Russian agents during the 2016 election. He is also investigating potential efforts to obstruct that initial investigation—including possible obstruction of justice by the President himself. No criminal investigation in the past forty years—perhaps no criminal investigation in American history—has been so fraught with complex legal and political issues. Professor Crespo has written and spoken extensively about these issues in the national press. For any attorneys who attend, we have been approved for 1 general CLE credit for this program. Professor Crespo teaches criminal law and criminal procedure, and his research focuses on the institutional design and administration of the criminal justice system, with a particular focus on the administrative role courts play in regulating law enforcement behavior. As a law student, he served as president of the Harvard Law Review, the first Latino to hold that position. Prior to joining the HLS faculty, he clerked for Associate Supreme Court Justices Stephen Breyer and Elena Kagan and served as a public defender in Washington, D.C. If you would like to view more information about Robert Mueller, you can click here for a program about him on the Aaron Harber Show. Your ticket price includes a three-course, served dinner, Professor Crespo's talk, and the discussion period following. Entree choices are: (1) Roasted Chicken Breast Choppette with Mushroom Risotto, Asparagus, and Sundried Tomato Cream Sauce (gluten-free) or (2) Vegetarian Butternut Squash Raviolis with Crispy Fried Sage, Browned Butter Sauce, Roasted Red Peppers, and Sautéed Chayote Squash. A cash bar will be available before and during dinner. The price is $45 for early registrations (limit 2 per member) and $55 (no limit) thereafter. Early registration will end when 50 tickets have been sold or on November 4, whichever occurs first. [Early registration ended on October 23 when the 50th ticket was sold.] Catering constraints require us to close all registrations after November 14. We will not be able to accommodate walk-ins. You must be signed in to the website to purchase tickets. Payment by check can be sent to RMHUC, PO Box 2345, Denver, CO 80201-2345, and be sure to include all names (as you'd like them to appear on badges and entree choices. Or, you can phone Fred Ris at 303-746-4287 with a Visa or MasterCard in hand. * When you sign in to the RMHUC website - http://rmhuc.clubs.harvard.edu - your membership status appears where the sign-in icon had been on the home page. After you are signed in, go to http://rmhuc.clubs.harvard.edu/memsub.html to join. Please do not register on the site as a non-alum. ... a total of 117 guests.